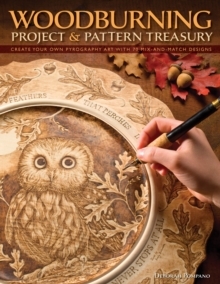 This title offers a fresh take on the craft of woodburning by focusing on the drawing, lettering and design elements that will add dimension and composition to any pyrography project. Pompano shares 5 tips on how to create a vast variety of dimension, shade and texture with your woodburner and how to develop your drawing skills for use in pyrography. The patterns cover a wide spectrum of themes including; harvest, wildlife, seaside and much more. The book includes two practice exercises, one step-by-step project and close-up instruction on lettering.